Congratulations to the 2013 NASCAR Hall of Fame inductees, and long overdue for one of the greatest of all-time Glenn "Fireball" Roberts. This is a baseball related post, since "Fireball" got his nickname from his days as a pitcher for the semi-pro Zellwood Mud Hens (FL) not from his exploits on the track. His life was, tragically, cut short in a horrible 1964 wreck. 33 career wins. Going to enjoy the best day of racing, the Indy 500 followed by NASCAR's Coca-Cola 600. Have a wonderful, safe Memorial Day weekend everyone. I will confine my NASCAR rantings to this post this season. Congratulations to Darrell "Bubba" Wallace Jr. for becoming the first African American to qualify on the pole at an event since Bill Lester III in the 2003 in NASCAR's Truck series, and the youngest to do so EVER! A bright future for this young star. Good luck at Dover! I wondering what he's telling Miss Georgia...I'm guessing she's about to blush! ullmandds wrote: I wondering what he's telling Miss Georgia...I'm guessing she's about to blush! I'm thinking it's something along the lines of looking under the hood or something to do with the back seat. Ohhhh... I am a rockabilly redneck. Horsepower followed by hoarse hour. Bubba Wallace 10th at Dover. Okay, a brief summary of the most frustrating week in NASCAR history. Last Sunday, with the assistance of Brian Vickers, Joey Logano, David Gilliland, and Clint Bowyer; Martin Truex entered the Chase Sprint Cup playoffs. On Monday, NASCAR determined Vickers pitted late, and Bowyer spun out on purpose with seven laps to go, so MWR teammate Truex could get in the chase, and bounce Ryan Newman out of it. NASCAR's ruling Truex out, Newman in. On Friday, NASCAR determined Joey Logano, and David Gilliland conspired to advance Logano's position in the Chase, and bounce Jeff Gordon out of it. NASCAR's ruling Jeff Gordon in, as an unprecedented 13th contestant on Friday the 13th, and penalties placed on the teams of Logano and Gilliland. What a mess! All of this without a single lap under green. Might as well have settled it by lottery or ouija board. All of this to enter the playoffs, and baseball fans thought the MLB wild card was complicated. At least MLB, NBA, NHL and the NFL stand by their results, regardless of bad calls and unethical practices... now that's integrity! I gotta admit, I'm having a tough time understanding the terms here, but I am a NASCAR neophyte. In fact, I have just about no interest in the sport at all. But it sounds like there's some funny business going on. Noone understands it. That's the point. Only the France family gets it, who are beginning to resemble the McMahons from the WWE. I am highly suspicious of almost everything in sports, but this is beyond the pale. I guarantee every person on a doomsday preppers TV broadcast has a piece of NASCAR memorabilia in their home. They are speaking to an already highly speculative audience. This is stirring the hornets nest. Great thread. I just started collecting NASCAR cards this year (Press Pass makes some cool cards) and have been watching the Sprint Cup and Nationwide series and I'm hooked. In fact I'm watching Kyle Busch win the Dollar General 300 at this very moment. The NASCAR card and memorabilia hobby has a lot of room for growth. Sets are a bargain compared to the Baseball, Football, Hockey, and Basketball. Beckett also puts out a yearly guide. Good luck to Kyle Busch on the Chicago-land clean sweep this afternoon. Buried by the World Series & College Football on Saturday: Darrell "Bubba" Walllace Jr. became the first black driver to win a NASCAR race since Wendell Scott in 1963 yesterday. Congratulations to a talented young driver. 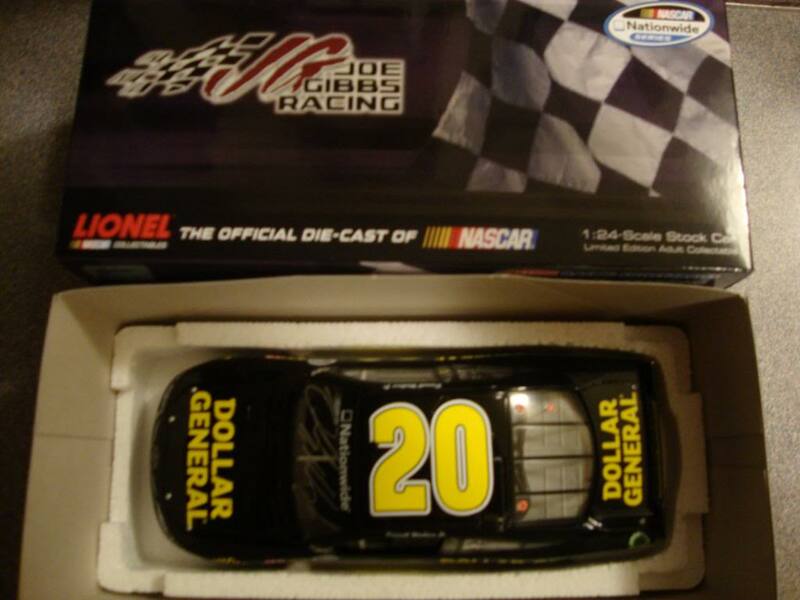 I buy one 1:24 autographed diecast model per season, and this year I purchased this "Darrell Wallace Jr." signed diecast shortly after he won the pole at Dover (mentioned above). Probably doubled in value lastnight. Though he usually runs the #54 Camping World Truck, here's his #20 from the one Nationwide race he ran in 2012..... he'll be in THE SHOW soon. Picked up this 1937 Auto Union Streamliner Rennwagen Tobacco Card. Pictured on the radically insane north turn at Avus racetrack outside Berlin. At 43 degrees, without a guardrail for safety, this turn was known as the "Wall of Death"... and the 1939 MG Magnette. 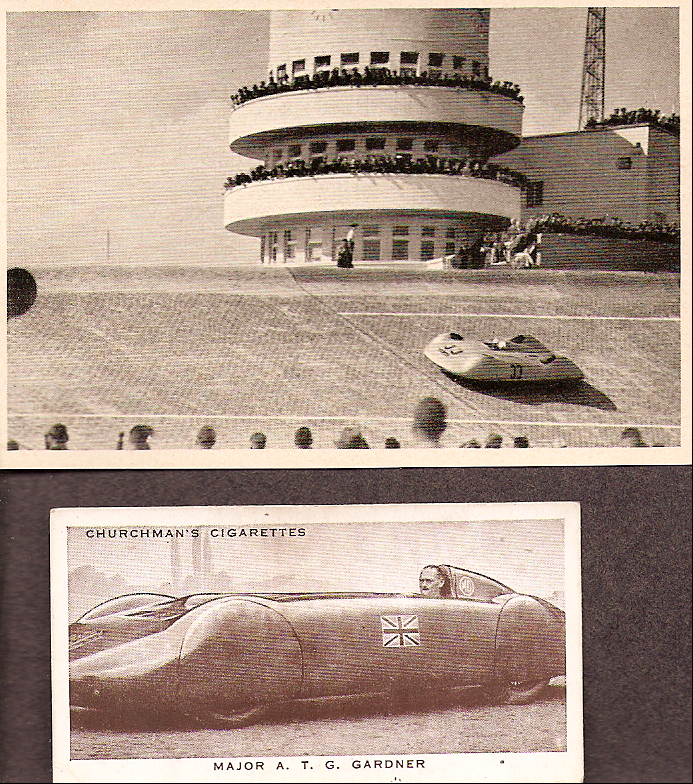 These were not "far-out" fantasy cars but land-speed record setters of the late 1930's. Speeds achieved by the Rennwagen at Avus would not be equalled at Indianapolis for another 30 years. Not your usual addition on a baseball card forum, but picked up this 1970 Chevy Nova yesterday (bottom). 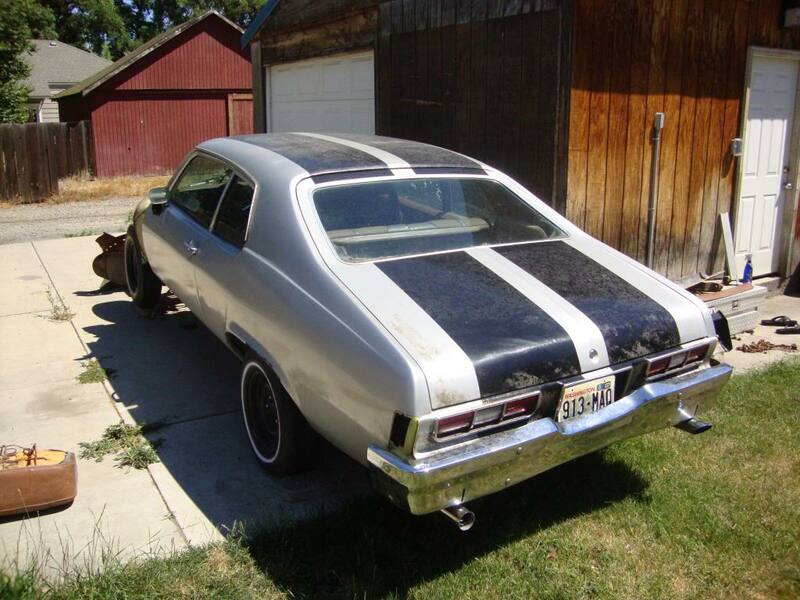 This project began three years ago, when I purchased a 1973 Oldsmobile Omega (below), and stripped it down to nothing (interior was gutted, driver's seat only, weighed just 2,575 lbs.). Worked on that car until last fall, dropped in a 396ci from a GM Station Wagon, after a few performance modifications it produced a little north of 400hp, she was SCARY fast. 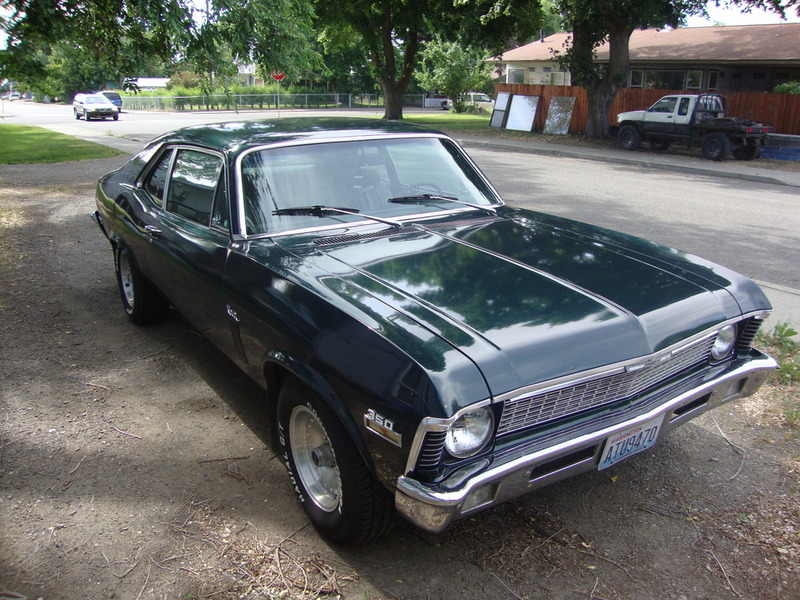 Traded it for the Nova, some typical rust issues with the floorboards, but she's a runner and straight as an arrow.